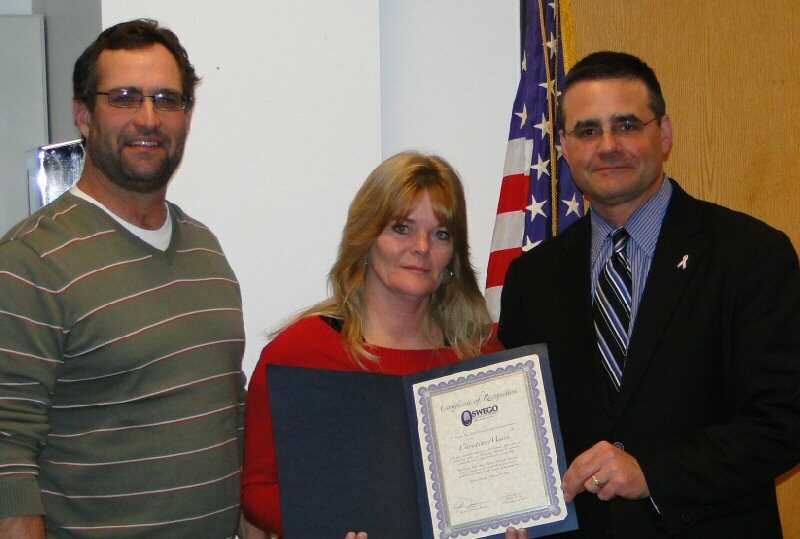 OSWEGO, NY – Oswego School District bus driver Christine Marsh was recognized by the Oswego City School District Board of Education and the Superintendent of School for her immediate response to a child in need. A two-year-old boy was seen wandering along West Fifth Street and Marsh pulled over to take him to a secure environment. Her alertness and speedy actions, on February 15, averted a potentially serious safety situation for a young child. She was thanked, during the February 28 Board of Education meeting for her actions by Board President John Dunsmoor and Superintendent of Schools Bill Crist, right.